Holiday.gr - Pyrgos, a trip to a myth! Pyrgos is a beautiful village on the hill-side of prophet Ilia on the highest point of the island. It has a glorious view, all Santorini, lies before your eyes. It is only 7,5 km away from Fira. Pyrgos was the capital of the island untill 1800. 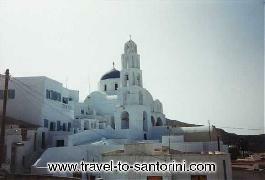 Worthseeing is the monastery of prophet Ilia that is built on the top of the homonym hill, as well as, Theotokaki, one of the oldest churches in Santorini that was possibly built in the 10th century. You will also see Kasteli, the medieval castle of the island. Been to Pyrgos ? Share your experiences!